Chichester Cormorants have unveiled their new starting blocks at the Westgate Leisure pool. Cutting the ribbon was the deputy leader of Chichester District Council, Eileen Lintill – and unable to resist the poolside excitement, she stayed on to set the swimmers off for some practice starts. Head coach Kerrin Cruttenden explained what a difference the new facilities would make for the swimmers. “Being able to train on the same kind of blocks as you find in top-level competition is a massive advantage. We’re already seeing it feed through into race results, with lots of swimmers recording personal-best times at recent competitions,” said Cruttenden. The new starting blocks have been funded through a real community effort. The main funding came from the council, with further money raised by club sponsors Glanvilles Solicitors and a raffle of jewellery donated by Pressley’s Jewellers. To get the new blocks installed, Cormorants member Andy Newell and Westgate centre manager Richard Minton stayed up working into the small hours. The last word on the new facilities goes to self-confessed competitive-swimming newbie Cllr Lintill: “Even I, not a particularly strong swimmer, can see the difference these new starting blocks have made. * An élite group of Chichester Cormorants swimmers raced at the Solent long-distance meet in Portsmouth. Despite it being their first time competing over more than 100 metres for several of the swimmers, the club collected four medals. James Lake swam a beautifully paced race to win silver in the nine to ten years boys’ 800m, with club-mate Alex Sydenham behind him in bronze. 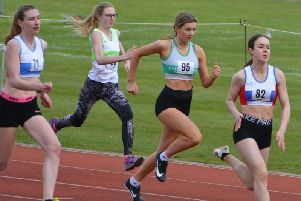 In the nine to ten girls 800m, Ella Seacombe picked up a bronze medal. And at the other end of the age scale, 51-year-old Masters swimmer Paul Mason took bronze in the open age group 1500m.